Glasgow is regenerating and evolving at a dizzying pace – style cats beware, this city is edgy, modish and downright ballsy. Its Victorian architectural legacy is now swamped with cutting-edge style bars, world-class venues to tickle your taste buds, and a hedonistic club culture that will bring out your nocturnal instincts. Best of all, though, is Glasgow’s pounding live music scene which is one of the best in Britain and assessable through countless venues dedicated to home-grown beats. The city is going through a long-term transformation, evident along the revitalised River Clyde, where visitors can explore Glasgow’s mighty maritime heritage along riverfront walkways. Museums and galleries abound and the cities resume has been made even more impressive with the reopening of the colossal Kevingrove Art Gallery & Museum – which in typical Glaswegian fashion, strips the city of any false pretences and tell it like it is – both the inspiring and the infuriating aspects of life here. 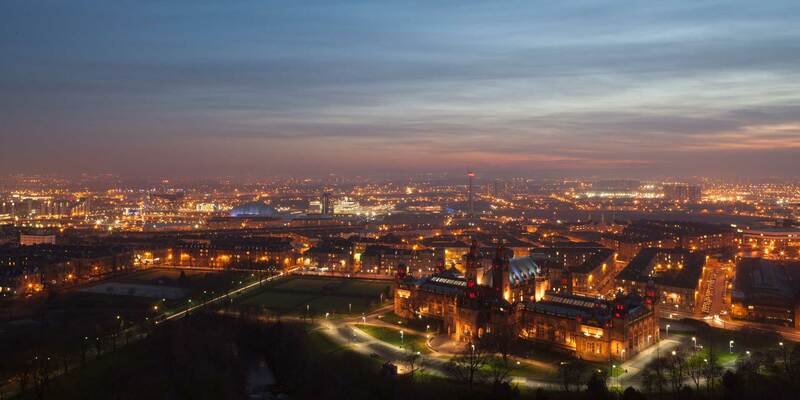 Glasgow combines urban mayhem and black humour and is so friendly it sometimes downright unnerving – throw off the shackles of urban restrain and immerse yourself in a down-to-earth metropolis that is all about fun. And besides, where else in the world can you land in the middle of a city in a seaplane? Glaswegian’s are proud of their working class background and leftist traditions. Their rivalry with Edinburgh is fierce and folk of full of contempt for what they see as a prissy, right-wing establishment of the east coast full of toffs with clipped accents and infuriatingly, holding the title of capital city. However Glaswegians remain themselves that Edinburgh may be the capital, but Glasgow has the capital. Glasgow is a must see attraction and is worth a stop on your Scotland tours.